Approx. 920mm x 500mm ... that's more than 12 1⁄2 cubic feet; perfect for making large prints in 1 piece or many prints at once! Greater build volume, greater possibilities. Print large multi-material, multi-color prints and support structures. 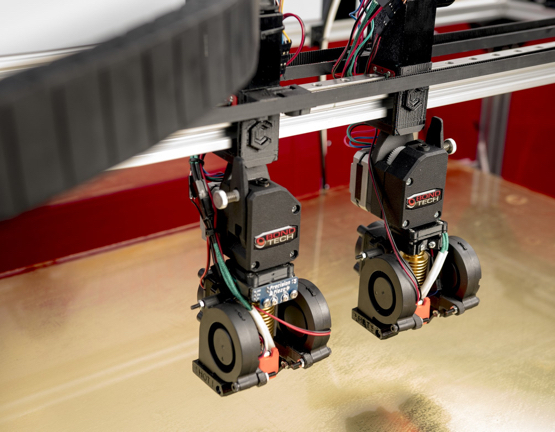 Shorter print times when making multiple copies, mirrored counter parts or detailed models. No more ooze from using 2 nozzles on the same extruder. Highest quality, genuine Duet WiFi board from Duet 3D. The PEI sheet offers excellent adhesion for printing and truly hassle-free print removal. Capable of printing mirror counterpart while making the original part. No more slicing and reprinting. Can print a model that requires 2 materials and 2 colors. Offering endless possibilities for the user. This printer is THE 1st to have this on such a large size print volume! Provides an accessible and simple interface for when WiFi connectivity in unavailable or to use the printer on it's own. In the event of faulty power or outage, the print process is not lost. When the board detects input voltage as dropping, the board will write a file to resurrect the print upon power retrieval, based on where it left of at time of power failure. The heads will then self-clean and resume printing. May be the quietest 3D printer on the market with it's faint motor noise level.